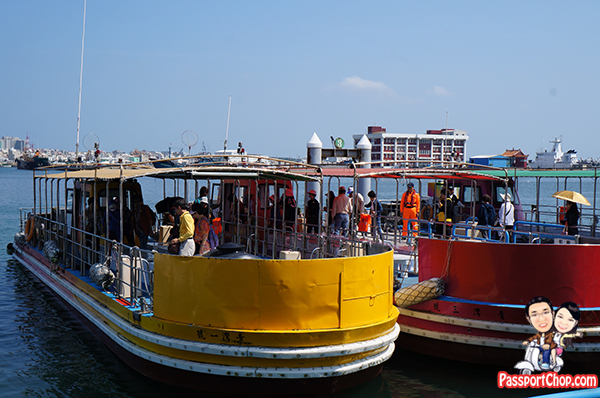 After a fun morning at Jibei Island, we took the 18-minute boat journey back to Penghu mainland for our next destination – 青灣海洋牧場 (Marine Leisure Farm). 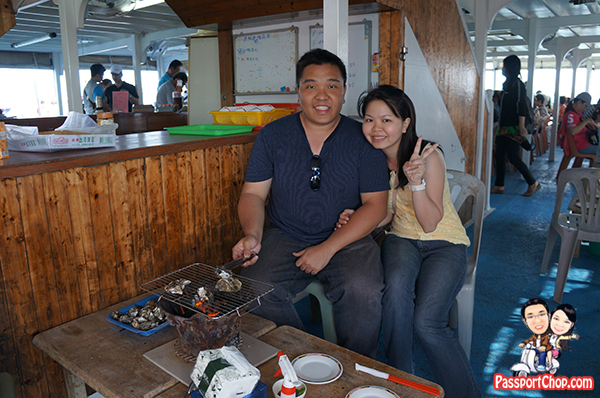 To get there, we will need to take a boat from 南海遊客中心 South Sea Visitor Centre (near Magong City). This tour is only available from March to October each year (this year it starts at 16 March 2013 and ends at 15 October 2013 – 3月16日起至10月15日止). It will cost NT 500 for adults/ NT 300 for child (3 – 12 years old) / Free for child below 3 years old (票價:大人500/人 小孩:300/人(3-12歲) 3歲以下不用錢). Guests should “check-in” 20 minutes before departure (提早20分鐘到服務台辦理報到手續). The tour starts with a cruise around Green Bay (青灣). Green Bay is a natural inlet stretching from the west of Shih-lishamao Mountain (蒔里紗帽山) in Makung City to Fengkui (風櫃). The bay’s ecosystem is mainly composed of coral reefs, which are a habitat for many species of fish, shrimps, crabs and sea shells. 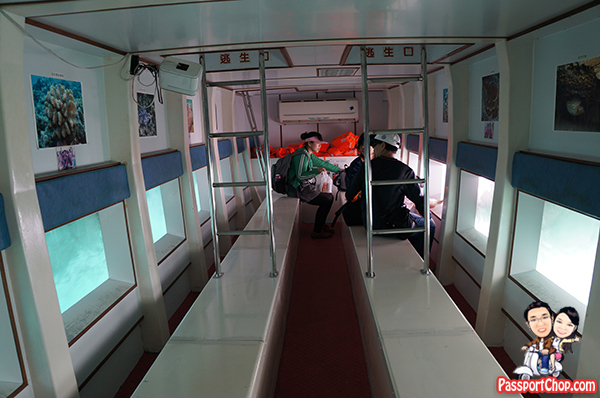 The 和慶 tour boats are actually “half-submarine” (半潛艇) so a part of the cruise involves going below deck to take a look at Green Bay’s coral reefs (欣賞青灣海底珊瑚礁) through portholes at the lower deck of the boat. The boat will stop its engine in the middle of Green Bay and once all the bubbles and sand had settled, you should be able to see the coral reefs with clownfishes (or better known as Nemo) swimming amidst it. Unfortunately for us, we were there when the tides were changing so there was a lot of underwater currents which stirred up the sand, making the view very murky but you can still make out the outline of some of the coral reefs. The best thing about this part of the cruise is that the lower deck is air-conditioned – so a quick escape from the summer heat on deck. 🙂 Once the boat moves, the view becomes very murky with the ship propeller stirring up the sand and water around the boat so you will still need to move up deck after this short stop around the coral reefs. 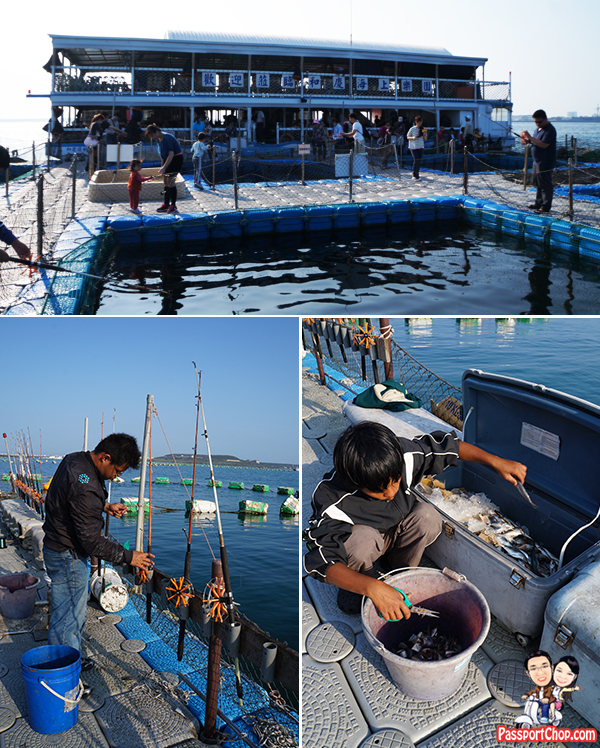 After stopping by the coral reefs of Green Bay, the boat will then bring all guests to the Marine Leisure Farm 「和慶海上平台樂園」. The group will have 3 hours of free time at the Marine Leisure Farm where guests can do anything of the following or all of them for free! All guests can help themselves to the free flow seafood porridge – self-service by scooping from a huge pot of porridge – remember to dig deep because that’s where all the good stuff e.g. prawns, clams and other seafood are (at the bottom of the pot). Expect long queues at the pot. For the oysters, there are trays of raw oysters available at the bar counter – just help yourselves to the trays when you are done with your own tray of oysters. Wasabi sauces are available too. There is only one TV with KTV console – I am not sure about the variety of songs but first, you will have to contend with groups of aunties and uncles who are just as eager to sing their hearts out. Barbequing oysters is not an easy task – some oysters can be rather stubborn and typically, it involves a lot of knocking on the table, prying and waiting and when the oysters are cooked, expect spurts of hot sea water from the oysters but well, you have 3 hours to slowly enjoy the oysters here at the Marine Leisure Farm. 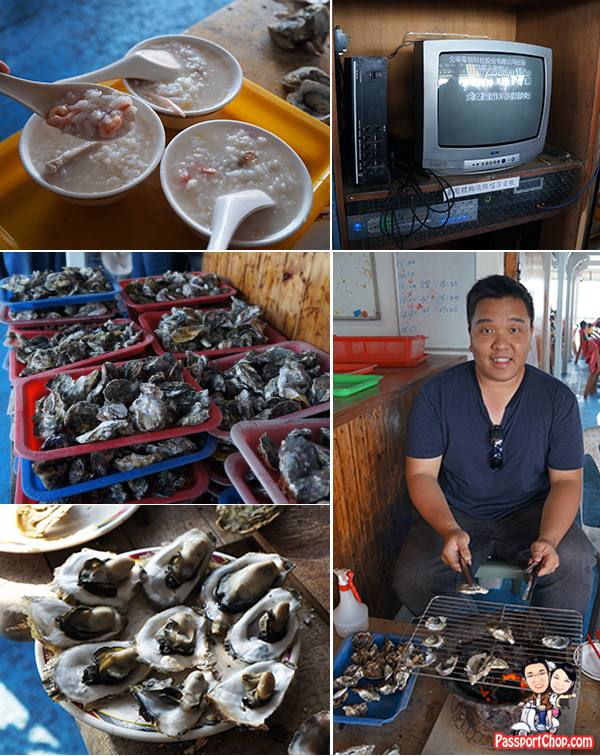 One thing to note is not to drink the “soup” in the oyster shells even when it is cooked. Those are not the essence or “soup” of the oysters – just heated sea water. All utensils, BBQ tongs and charcoal for BBQ-ing (you can request for more charcoal) are provided – so just BBQ away! Check out the video below for some simple steps on how to cook/bbq the oysters and what else you can do on the Marine Leisure Farm for 3 hours! Once you are done with your BBQ-ing, you can do some fishing at the platform beside the Marine Leisure Farm – it is catch and release though (in fact even stricter, you are not allowed to pull the fishes out of the water! You will be charged NT 500 if you do that). You won’t be fishing from the open seas – these fishes are bred on the platform and they swim around within the net. All you can do is let the fish finish eating the bait and it will swim off by itself – but still there is slight thrill of something latching on to your fishing rod’s line. There is no hook on the line so it won’t hurt the fish too. Don’t worry if you haven’t fished before or don’t want to get your hands dirty by fixing the bait – the staff will fix the bait for you – all you have to do is take the fishing rods (there are a lot of them) with bait fixed and go fishing! we got it from Qiito.com – you can set up your own travelogues there to get the interactive map. There are a lot more such maps there. ^_^y I am using Qiito also just that dunno how to embed the Map like you do. Quiet cool, never I will explore again.